Driving Should Be an Extension of Your Soul. In a 2018 MX-5, you’ll enjoy the true essence of human and machine as one. Beautiful proportions, perfectly balanced and race-track tested, the MX-5 is crafted with advanced technology like SKYACTIV TECHNOLOGY and i-ACTIVSENSE safety alongside a time-honoured eye for aesthetics and detail. Delivering a soulful connection to the road you won’t find anywhere else. Celebrating Mazda’s 50th Year in Canada. Mazda is celebrating its 50th year in Canada with an Anniversary Limited Edition MX-5 soft top. Starting with the GS model with 6-speed manual transmission,†† we’ve added some special features for the 50th. Revel in a superb audio experience with a custom Bose® sound system with AudioPilot® 2 noise compensation technology. And as a part of that system, you’ll love the speakers and subwoofer mounted in the driver’s and passenger’s headrests. 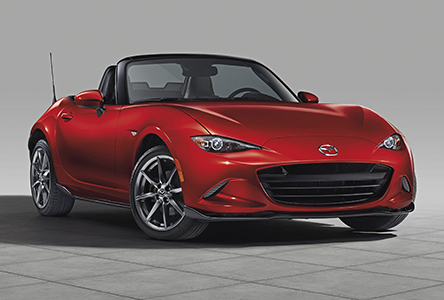 To round it off, 17-inch BBS® forged alloy wheels with dark finish will give you MX-5 a unique, sporty look. Come celebrate 50 years of Mazda in Canada with us! For Mazda engineers, harmony is not simply an ideal; it’s a promise. That’s why, for more than a quarter of a century, every MX‑5 has been designed with near perfect 50/50 weight distribution for a smoother, more connected driving experience. Of course, the delicate harmony of the front mid‑ship engine and rear‑wheel‑drive configuration is not balanced without you, the driver, sitting behind the wheel. Weight distribution is the single most important factor in the MX-5’s design, making it incredibly responsive to driver input and behave as the driver intends. Watch a demonstration of the MX-5’s remarkable front-to-rear balance. The 2018 MX-5’s fine tuning includes adjustments of the rear bump stop lengths and the bushing has been altered to enhance control during turns. The power steering also has been tweaked to maximize the effect. Light on its Feet. Powerful where it Matters Most. How can a car so historically lightweight possibly undergo such an aggressive weight loss? By using materials like aluminum and ultra-high-tensile steel, the MX-5 has shed 20% of the weight of its previous generation model without sacrificing superior handling and stability. Its lightweight, receptive driving dynamics make driving this vehicle a purely breathtaking experience. For the 2018 MX-5 we have improved the sound insulation in critical areas such as the inner wheel housing and vehicle bulkhead. The result is a reduction in vehicle vibration and a smoother, quieter ride. The Roadster Designed with Drivers in Mind. From its strikingly muscular appearance, to its sensationally intuitive feel, every stitch and seam of the 2018 MX-5 is woven together meticulously with the principles of KODO design to ensure a profound connection between the driver and vehicle. Comfortable on the inside yet aerodynamic on the outside, the MX-5 is designed to quickly respond to instinct and offer a compellingly thrilling drive. Now available with a stunning Dark Cherry roof. The MX-5 is designed to be exhilarating at a standstill. Starting with its signature curves and beautiful sloping hood, the muscular stance evokes the feeling of motion and the desire to get in and drive. Eye-catching LED lights and round rear lamps not only elevate the design but also improve visibility at night. 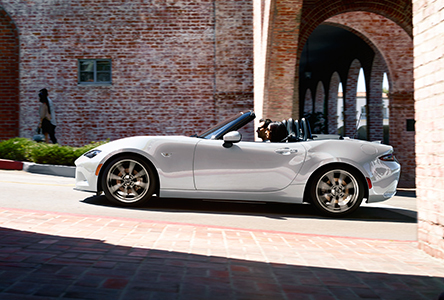 Customize the look and feel of your MX-5 with new luxury sport options. 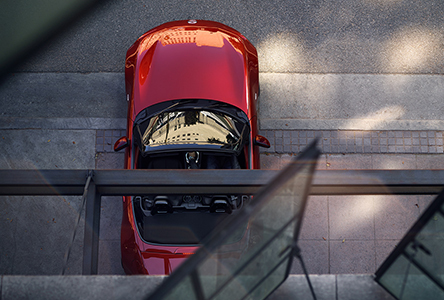 Customize your MX-5 with the new, optional Dark Cherry** folding roof that will heighten its curb appeal. 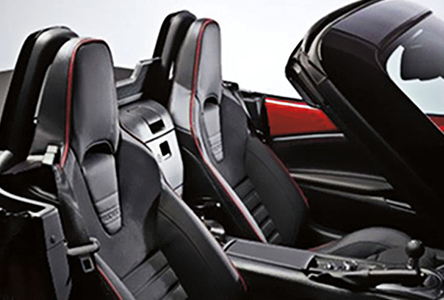 And new, available Chroma Brown Nappa leather-trimmed‡ seats are a stunning premium upgrade for some added flair. Mazda debuted the MX-5 in 1989, quickly captivating car enthusiasts with its sleek, compact design and signature rounded tail lights. Since then, fans and collectors have assembled clubs across the world to celebrate this timeless vehicle. Four generations and one million dedicated owners later, the MX-5 is the proud winner of many awards, including the 2016 World Car and World Car Design Awards. The MX-5’s lightweight build and aerodynamic body have established it as an iconic race car, with more Mazdas and Mazda-powered vehicles raced on any given weekend than any other car. The SCCA Mazda MX-5 World Cup has ran for over a decade, featuring many notable up-and-coming racers, reminding car enthusiasts that the MX-5 is just as exhilarating on the road as it is on the race track. At Mazda, we’re all about proactive safety measures that swing into action to alert you so that you can avoid a collision or lessen its impact. Now with more standard i-ACTIVSENSE features, our suite of safety technologies help you stay in tune with your MX-5 and focus on the road ahead. The Advanced Blind Spot Monitoring sensors detect objects in the left or right blind spots. If the driver signals a lane change while an object is present, a light in your corresponding side mirror blinks and a warning chime sounds. When backing up, Rear Cross Traffic Alert detects a vehicle approaching from the side and promptly alerts the driver with an audible and visual warning in both side mirrors. LDWS† automatically senses lane markings on the road and alerts the driver when it predicts the vehicle is going to unintentionally depart from its lane. HBC† helps the driver see better at night by maximizing opportunities to use the high beams. The system automatically switches to low beams when it detects oncoming traffic and/or a vehicle ahead. AFS† helps you see around corners at night. As you turn into a corner, the headlights pivot up to 15 degrees in the direction of your turn, improving visibility and allowing you to spot potential hazards and dangers ahead. **Optional on the GT model. Not available with Nappa leather or Soul Red Crystal Metallic, Eternal Blue Mica and Ceramic Metallic exterior colours. ‡Optional on the GT model. †Standard on the GT model. ††The MX-5 50th model is only available with manual transmission. ®Bose is a registered trademark of Bose Corporation.